Save on this safety set including the 2017 edition of NFPA 654 and the NFPA® Guide to Combustible Dusts. Failure to analyze dust hazards and use the correct mitigation strategies puts companies at serious risk for fire and explosions, and there is a significant fiduciary penalty for the presence of dust hazards in any facility. If you deal with materials or processes that result in the accumulation of dust or small particles, be proactive with NFPA's Set. This combination offer includes the latest NFPA 654 -- the Standard referenced by OSHA's Combustible Dust National Emphasis Program (NEP) for the purposes of identifying dust hazards and defining mitigation strategies that protect life and property -- and the essential NFPA Guide to Combustible Dusts. 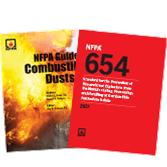 The NFPA 654 and Guide Set is invaluable for company owners, operators, safety managers, inspectors, insurers, and anyone responsible for safety around dust hazards.